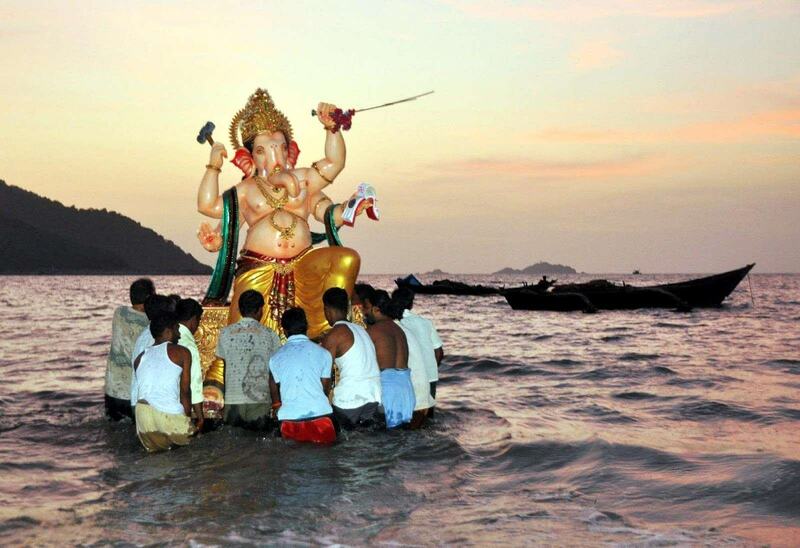 Why do we do Visarjan of Ganpati Bappa in Water? Home » Why do we do Ganesh Visarjan? As per Hindu tradition, the Puja has completed the idols of Ganpati Bappa should be immersed (Visarjan) in water unless you worship a God in the form of an idol in a temple, performing daily Pujas etc. Ganesha Chaturthi is the Hindu festival celebrated in honor of the elephant-headed god Ganesha. Festivities usually finish in 10 days, on the fourteen, the day of the same fortnight Anant Chaturdashi. Hindus pray to images of Lord Ganesha. Either large or small, many of them made especially for the occasion by cottage industries and street side artisans. The idols are made from clay and it has to become clay again. At the beginning of Puja, the Lord is invoked by chanting mantras. If you wish to keep the idol for more number of days you have to offer special daily Pujas as per the custom. The private celebration involves installing an appropriately sized clay image at home and worshipping with family and friends. In both cases, at the end of the festival, the idols are immersed in a body of water such as a lake or a pond. It is also said that the Gods after the pujas go back to their Heavenly abode. For this reason, they are immersed.